The earliest Egyptian mummies date back to around 3200 B.C. Hieroglyphics from tombs describe how the mummification process evolved over time. In the beginning, preparers would simply treat the body by covering it with a natural salt, called natron (baking soda), to help dry it out, and then wrap it in bandages soaked in a type of resin. 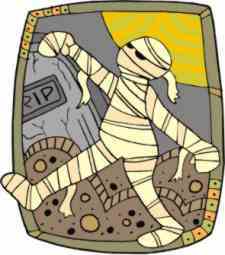 Around 1500 B.C., the art of mummification reached its peak. Before treating the body, morticians would remove the brain and many vital organs. Then they would pack the abdominal cavity with natron, sand, or sawdust and immerse the body in more natron for about 40 days. After that, the body was washed, repacked with spices and more natron, and wrapped in bandages. The whole process took about 70 days. Have you ever wondered why every time you eat salty foods, you get thirsty? Or why fresh vegetables tend to shrivel up when you sprinkle salt on them? The answer is simple. Salt is a desiccant - it helps remove water from things, including human bodies. Which is why the Ancient Egyptians used salts when they were mummifying bodies. In this experiment, you can test different salt compounds and to find out which makes the best mummified apple. Slice the two apples into quarters so that you have eight slices similar in size. Place a piece of tape on each cup and write the words "starting weight." Select one slice, weigh it, and record the weight on the outside of cup 1. Follow the same procedure with the other seven apple slices until each cup has been labeled with the appropriate starting weight. If you don't have a scale, try to cut all the apple pieces to the same size. Put 1/2 cup of baking soda into cup 1, making sure to completely cover the apple. Write the words "baking soda only" on the outside label. Fill cup 2 with 1/2 cup Epsom salts and label. Fill cup 3 with 1/2 cup table salt and label. Fill cup 4 with 50:50 mix of Epsom and table salt then label. Fill cup 5 with 50:50 mix of table salt and baking soda and label. Fill cup 6 with 50:50 mix of baking soda and Epsom salts and label. Fill cup 7 with a mixture of 1/3 baking soda, 1/3 Epsom salts, and 1/3 table salt and label. At this point, seven cups should have an apple piece and 1/2 cup of salt mixture. Cup 8 should have just a piece of apple as control for the experiment. Place the cups on a shelf out of direct sunlight and let them sit for seven days. After a week has gone by, take out each apple slice, brush off as much salt as possible, and reweigh. (Do not rinse the apple off because that will rehydrate it.). Compare the starting and ending weights of each slice and calculate the percentage of weight which is moisture lost for each by dividing the difference in weight by the starting weight. If you don't have a weigh scale, put the apple pieces in order of size (make sure to keep track of which piece was in which cup! Which salt would seem to work best at making an apple mummy? Would you have achieved the same results if you used a whole, un-peeled apple? Try it and find out. What was the point of leaving one of the apple slices in a cup without any salt at all? Where did the moisture in the slices go? How could you confirm this? Salts and special drying solutions played important roles in preserving mummies, but they also served another purpose. 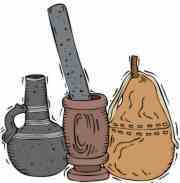 Before refrigerators and freezers, people had to preserve food by pickling, drying, salting, and smoking. Visit a local food store and see how many foods you can find that have been preserved the same way as mummies. Try your hand at drying different fruits. How do the textures and tastes compare? This idea comes from the Newton's Apple website. Looking for gift ideas for someone who is fascinated by Ancient Egypt.